[By Nick] With the release of Turkey Hill’s limited edition calendar for 2014 last month, Dubba and I decided to have a contest to see who can review the most limited edition flavors this year. 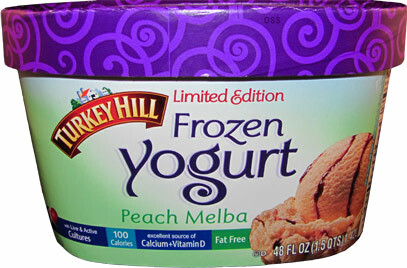 Since my stores are slow, let’s start this off with a limited edition flavor that you still might find: Peach Melba Frozen Yogurt. At first, the flavor combination of raspberries and peaches seemed odd to me. However, I remembered Dubba’s review of New Orleans Peach Melba and realized it actually was a thing. I mean, I do like peaches and I love raspberries so this should be good, right? Let’s get right into this one. Not much is going on sensory wise when I opened the container. There’s no smell of the fruits yet and you can only see a bit of the raspberry swirl poking through. Time to scoop some into a bowl! The texture of the base is the same as it was with their Peanut Butter Pie flavor. I stand by my thoughts and still say I prefer the texture of Turkey Hill’s froyo to their regular ice cream. While not as creamy, it’s not all that far off. It’s the density that makes it more substantial feeling and satisfying. The flavor of the peach base is on par with Ben & Jerry’ Peach Cobbler. It’s very natural tasting without any artificial funk you tend to get with peach flavored yogurts. 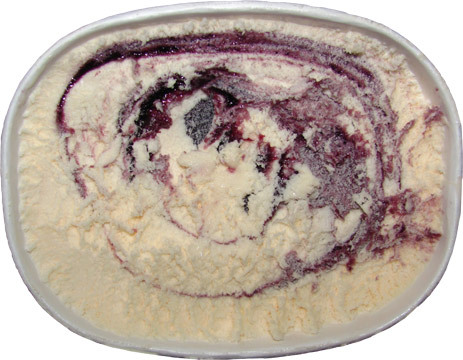 That’s nice and all but the real star is the raspberry swirl. This is by far the best fruit swirl I have every encountered. The swirl is somewhere in the middle of syrup and jelly texturally speaking. It’s not substantially thick or excessively runny and thankfully lacks any of that iciness that fruit swirls tend to get. The flavor is sweet, vibrant and slightly tart. The ingredient list doesn’t list what kind of raspberries they use but I’m pretty sure it’s black raspberries (which are my favorite). The combination of the two flavors makes for a refreshing treat. At 100 calories per serving, you can treat yourself to as much of this one as you’d like. My only complaint is the lack of any solid mix-ins. This frozen yogurt is a few cubes of pound cake away from being my all-time favorite peach flavor. That said, I’ll have no troubles finishing the rest of the container. If you see this one still on shelves, don’t hesitate to grab yourself a container because it won’t be returning anytime soon. This looks really good; hope I can still find it! Love the idea of adding pound cake. I was thinking smushed up graham crackers but I think that would be too sweet and crunchy. Anon, graham crackers sound like a good idea as well!